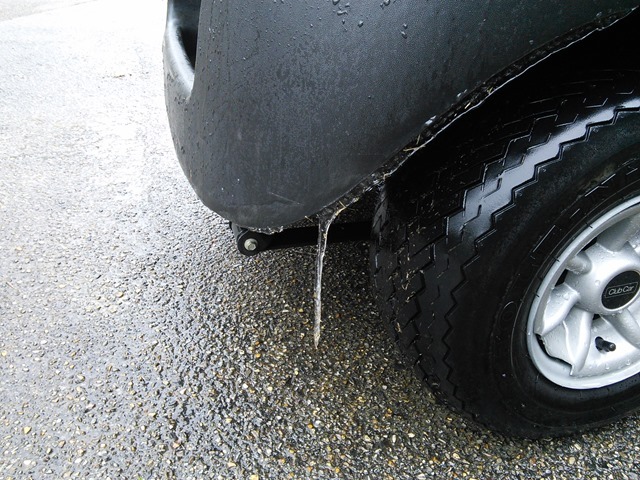 Cold enough to leave icicles on our only cart that went out for the day. It was 29° when I left the course at 3pm. The first cut of the year came in at +1. A stroke less than I thought. Doesn’t seem there were any surprises. Looks like “Scraper” snagged a live one in P. K. Kongkraphan who is currently T5. Still two rounds to go so hope I didn’t jinx him. Beth Ann Nichols Tweets – Jenny Suh, who got engaged on Dec. 19, has her fiancé on the bag. He came for the casino but the caddie gig is working nicely. She’s in 3rd. She also tweets that Martha Richards has resigned as head coach of Texas. Big news. Richards will step down at the end of spring for health reasons. She’s healthy now, but cancer survivor thinks it best to leave coaching. This entry was posted on Friday, January 24th, 2014 at 6:44 pm and is filed under Uncategorized. You can follow any responses to this entry through the RSS 2.0 feed. You can leave a response, or trackback from your own site. 5 Responses to How Cold Was It? Be prepared. If Bu88les Wie wins this event, the Golf Channel, the LPGA Tour, and 1/2 the golf writers in America will declare a national holiday. Was the tournament open to the public? Can’t really tell from the daily highlight videos on the LPGA website. I’ve seen bigger crowds in a phone booth. Scraper did make a brief appearance on the TV coverage today. ahhh, feng signs dreal wid bruick, do theya maka vehicle that drives thrua drive fru at midnight fur rate snacka?